The DSSH is the second largest scientific community supporting simulation and serious gaming in healthcare worldwide. The main goal of the Society is to improve patient safety and quality of healthcare. We stand for high quality scientific research on simulation and serious games. 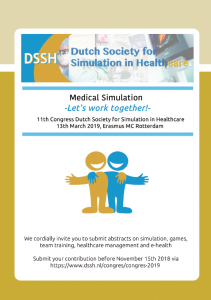 The DSSH is affiliated with the Society for Simulation in Healthcare (SSH), the Dutch Society for Medical Education (NVMO) and the Society in Europe for Simulation Applied to Medicine (SESAM). We have seen a rapid surge in newly developed serious games in medicine. Although we wholeheartedly encourage this development, we fear the risk of loosing overview on the quality and safety of the individual games. This threatens their implementation in medical training and patient care programs and will ultimately threaten future investments and funding. Therefore, the DSSH has instigated the Quality Label for Serious Games in Medicine, through which owners / developers of serious games can show the world that their serious game is a valid and responsible product, according to current scientific and legal standards. The extent to which these requirements are met, is judged using a scientifically based framework. The information that you have uploaded according to this form will be reviewed by the Committee for Serious Gaming of the DSSH. The information will be checked for completeness, after which it is distributed anonimously to the Committee members. Information will not be shared with any person or institution outside the Committee itself. Based on the information, a report will be drawn and shared exclusively with you. A short description of the game, the number of stars, and a short report will be published online on the DSSH-website. The information required by our framework is divided into 5 categories: Description, Rationale, Functionality, Validity and Data protection. The format for your answers is described, please comply to this form. It may require a document in PDF or .doc format. After the upload process is finished, we will check all information provided for completeness. Through this form, you can upload information on your serious / applied game with a healthcare-related purpose that you wish to submit to the Label. Submit your Game by clicking this link.